The BreedingTHREEBANDEDROSEFINCHThree-banded RosefinchCarpodacus trifasciatusThree-banded (or THREEBANDEDROSEFINCHThree-banded RosefinchThree-barred RosefinchThree-barred) Rosefinch is a medium-sized rosefinch that is native to western and southern China. The habitat is given as conifer forest, undergrowth and thickets at between 2,130m and 3,050m (approx. 7,000ft and 10,000ft). In the late autumn and early winter it descends to l,800m (approx. 5,900ft), to foothills and valleys, and in the winter is found in orchards, hedges and barley fields. Its breeding biology is described as 'virtually unknown' (Clements, P., Harris, P. and Davies, J., 1993). The adult male has a dark red head with white shaft streaks on the lores, cheeks and ear-coverts. The upperparts are grey, with a strong reddish tinge. The breast and flanks are wine-red, with the sides of the breast grey, while the centre of the lower breast, the belly and the lower flanks are white. The outer scapulars are white, forming a diagonal band above the closed wing, while the feathers of the median and greater wing-coverts are tipped with pink, thus producing the three-banded effect that has given the bird its common (and scientific) name. The female and juvenile have grey upperparts, streaked with black, yellowish-buff edges to the tertial feathers, warm orange-brown on the throat, breast and flanks, with the rest of the underparts white. This rosefinch measures 17cm-19.5cm (6¾in-7¾in) in length and conveys the impression of a solidly-built, sturdy species. Two pairs of Three-banded Rosefinches were obtained in January 1994. During the following spring one of the females died, leaving a spare male. The pair was housed in an aviary measuring 4m x 1.5m x 2m high (approx. l3ft x 5ft x 6ft l0in high). 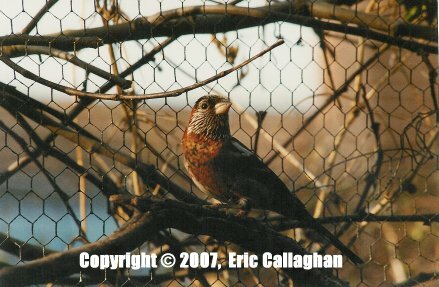 The aviary was divided into two adjoining enclosures, each approx. 2m (6ft 7in) long but the dividing door was left permanently open. The back and one side of the aviary are solid and part of the roof is covered with perspex. The aviary is unplanted, save for a 1.5m (approx. 5ft) Mahonia aqui1egfo1ia, as the birds destroyed any other attempts at planting. Bundles of heather are tied around the back and sides to provide cover. Short lengths of conifer branches were placed at the front corners, just below the roof, as experience with Pallas' RosefinchCarpodacus roseus C. roseus has shown that these would be preferred nesting sites. Indeed these were the sites chosen for nesting. From the beginning the pair shared the aviary with a pair of Yellow-throated Buntings Yellow-throated BuntingEmberiza elegans and a pair of Rufous-bellied Niltavas Rufous-bellied NiltavaNiltava sundara, neither of which attempted to nest. No aggression towards these species was recorded. Occasionally the male niltava would briefly chase one of the other birds, but nothing serious ever occurred. Perhaps it might have been different if the niltavas had gone to nest. This consisted of a canary seed mixture, mixed millets (rarely touched) and 'Puik' wildbird seed mixture. In addition, there was softfood for the niltavas which consisted of a mixture of Witte Molen Universal softfood and a homemade food, based on CéDé eggfood and ground peanuts. Mealworms were offered regularly, but the rosefinches were never seen to touch them. Greenfood, in the form of chickweed, was always popular. As with most species with red in the plumage, a colouring agent was required during the moult to maintain the colour of the feathers. This was supplied in the drinking water. One effect of this has been to produce a deep reddish tinge to the plumage of the female and the immatures that is apparently not present in wild birds. Bathing facilities are always available. The first year (1994) passed uneventfully, as the birds were settling down, although it was noticeable from the very beginning that the birds were steady and not shy. In March 1995 both males became ill from an unknown cause (the extra male was housed in a separate aviary), but both recovered after a few days. Throughout the summer both males sang and carried nesting material in the form of lengths of fibre and down. Whenever the female attempted to pick up material she was attacked and chased by the male, and was forced to drop it. The attack consisted of the male advancing rapidly along the perch, with the head lowered, the beak open and the mantle feathers raised. This was accompanied by a loud 'tsick, tsick' call. What sounded to be the same call was occasionally uttered from a perch in early May, apparently as an advertising call, and whenever I entered the aviary alter nesting had begun. The song of the male is a continuous, high-pitched, squeaky, twittering sound that is delivered so faintly that it cannot be heard from any distance away. It seems to be uttered as the male moves around the aviary, rather than delivered from a fixed song post. In the spring both males again became very ill and the unpaired one died. The second male made a complete recovery. At no time was the female affected. Again the female was attacked by the male whenever she attempted to pick up nesting material, but this time she was more persistent and by 18th May both were seen carrying bundles of coconut fibre. On 22nd May the female was seen carrying heather and birch twigs up to one of the branches that had been fixed at the front of the aviary. These twigs were about l5cm (6in) long. After three days no progress had been made as the twigs fell from the site each time the female left, and as she never retrieved any of them a small pile formed on the ground below. At this point I fitted a wicker basket at the intended nest site, with the result that the female promptly abandoned the site and started to attempt to build at the other site at the front of the aviary, with exactly the same result, as again the twigs failed to lodge there. Finally, on the 2nd June, the female returned to the first site and started to line the basket with coconut fibre. By the 5th June she was adding an inner lining of goat hair, plus a few feathers. The first egg was laid on the 8th June and was bright blue with just a few black spots at the blunt end. It was a typical rosefinch egg. A total of three eggs was laid and the male was occasionally seen feeding the female on the nest. At no time was the male seen to feed the female away from the nest, nor was any courtship behaviour witnessed, or copulation. Two eggs hatched on the 22nd June, the third hatched the following morning. The newly-hatched chicks were dark-skinned, with dark grey down. The gape was red. In an attempt to rear at least some of the young, one chick was transferred to a canary that was incubating an infertile clutch of eggs. All three chicks were very well fed, at times having crops so full that they looked about to burst. The male rosefinch took an equal part in the feeding of the young. For the first week the birds fed almost exclusively on seeding chickweed. Soaked seed and eggfood were offered but were not touched until the chicks were over a week old. Livefood was totally ignored. The young grew very well and by the 28th June the female had ceased brooding them for much of the day. It was very noticeable how solid and bulky the nestlings felt whenever they were handled, an intrusion which apart from producing the vocalisations already referred to, never seemed to bother the parents unduly. Unfortunately I was away from the 1st to 14th July, but I understand that the first chick fledged on the 7th July. On my return on the 14th both chicks were looking very strong (the chick fostered with the canary had failed to survive) and their tails were about one-third full length. In addition, I was surprised to discover that the female was sitting on a new nest at the second site, where I had placed a second wicker basket. This nest contained four eggs. This is in contrast to the Pallas' Rosefinch, which I had bred previously, where a second nest was never attempted, even in cases where the first nest had failed. During the incubation period of the second clutch, the young of the first brood developed the habit of sitting beside the female, even though the male had taken over all their feeding. The young were seen to pull at the nest and remove some of the material, so both they and the male were moved into the second half of the aviary and the connecting door was closed. The other species were also confined to this half, leaving the incubating female totally alone. This did not appear to bother the female and the following day (22nd July) one egg hatched, indicating that the first egg must have been laid just after the first brood fledged. At this stage there were only two further eggs in the nest. Neither of these hatched, although both were fertile. One was slightly damaged and half of the shell of the egg which had hatched had capped the other egg. The female reared the single chick without any problems and it fledged on the 9th August, therefore taking longer than the previous brood, that had been fed by both parents. On the 16th August the interconnecting door was re-opened and all the birds were allowed to mix. On fledging the young were a dull grey in colour, with pronounced streaking on the breast. Colour-feeding was resumed at the end of August and while both young of the first brood developed red in their plumage, the chick from the second brood failed to do so, indicating that it was not consuming any of the treated water. This youngster developed a greenish-yellow colour where the others were red. Of the first two young, while both superficially resembled the adult female, on closer examination one was seen to be slightly brighter than the other, with slightly more extensive colour. The uncoloured immature seemed to follow the second chick from the first brood with regard to its plumage pattern. This suggests that perhaps I had one male and two females. Later the 'female-coloured' immature from the first brood died and n dissection proved indeed to be a female. The remaining young were left with the adults throughout the winter until the beginning of March 1997, when the adult male began to chase them a little. In terms of general management these rosefinches have presented no problems, save for the mystery illness of the males. Unfortunately, it was not possible to arrange to have a post-mortem examination carried out on the one that died. The birds showed no aggression towards other species and the rearing of the young was quite straightforward, without the inconvenience of having to supply livefood. CLEMENT, P., HARRIS, A. and DAVIES, J. (1993). Finches and Sparrows, An identification Guide. Christopher Helm/A. & C. Black, London. 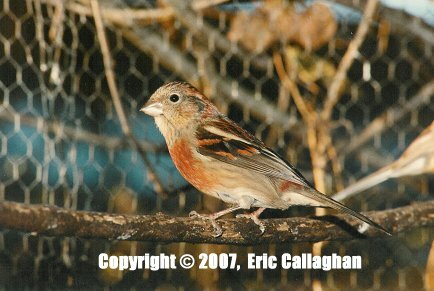 As described above, the Three-banded Rosefinch Carpodacus trifasciatus, has been bred by Eric Callaghan. This is probably the first successful breeding of this species in Great Britain or Ireland. Anyone who knows of a previous breeding is asked to inform the Hon. Secretary.